Νεαρός Ελληνοκύπριος, 30 χρονών, πυροβολήθηκε πέντε φορές κοντά στο χωριό Φίλια. A young Greek-Cypriot, 30 years old, was shot five times near the village Filia. 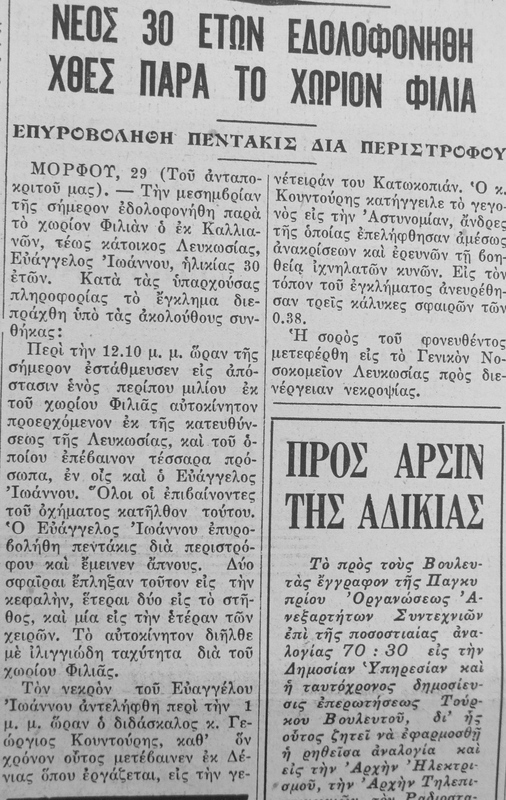 N.C., “A young 30 year-old was murdered near the village Filia,” Cyprus Critical History Archive: Reconsidering the culture of violence in Cyprus, 1955-64, accessed April 25, 2019, http://ccha-ahdr.info/items/show/1188.